Dueck, who competes for Canada but is currently based in Loxahatchee, Florida, was selected for the award based on her accomplishments in the areas of sportsmanship, horsemanship, and performance. The People’s Choice Award, presented by Cook, gives dressage enthusiasts at the Wellington show circuit this season the chance to have a say in which riders deserve to be recognized. Show staff, vendors, spectators, and competitors may be asked to vote. 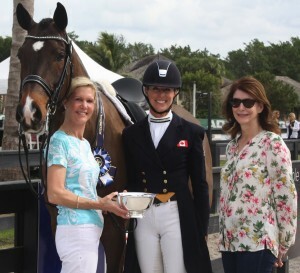 Cook, a successful Wellington-area realtor at Illustrated Properties— specializing in equestrian and luxury real estate— established the award as a way to give back to her dressage community. She presented Dueck with a ribbon sash and a beautifully engraved silver bowl. Shannon Dueck and the Hanoverian gelding Cantaris (Complement x Egida), owned by Elizabeth Ferber, competed in three classes — FEI Prix St. Georges (the largest ever in Global Dressage Festival history), FEI Intermediate I, and FEI Freestyle Intermediate I. Dueck was very pleased with the performance of Chester (as Cantaris is affectionately known) throughout the CDI. “He probably did some of the best extended work that he’s done, so I was thrilled,” she said. Although Dueck will be showing other horses over the next few weeks, she says she will bring Chester back into the ring very soon. “In another month, we’ll do another CDI. We’re trying to get scores — we’ve got our eyes set on representing Canada at the Pan Am Games this year.” Dueck won her first Pan American Games medal in 1999, when she placed silver with her self-trained horse Korona. Since those days, Dueck has trained and competed on a number of horses through the FEI levels. She also works with student riders, both at home and at shows. Cook is also a sponsor of the 2015 Adequan Global Dressage Festival. This fourth annual Adequan Global Dressage Festival will run through March 29, during which twelve (three national and seven international) weeks of competition will take place. This will include eight CDIs (including five CDI-Ws, one 4*, and one 5*), weekly U.S. National events, and the only non-championship CDIO Nations Cup in the Western Hemisphere. The show series offers more than $650,000 in prize money for the seven international competitions, making it one of the richest circuits in the world. For more information about Ann-Louise Cook and her business at Illustrated Properties Real Estate, Inc., please visit www.annlouisecook.com.